Super Mario's Wacky Worlds is a cancelled 1993 Phillips CD-i sequel to the 1990 SNES game Super Mario World. Developed by NovaLogic, only 30% of the game was complete before the game was cancelled. Only three prototypes of the game are known to exist, and a ROM of the game has been available for some time now and can be downloaded below. The game would've taken place in the real world as opposed to the Mushroom Kingdom, despite the fact that classic Mario enemies like Goombas and Koopa Troopas make appearances in the game. Development started only a few weeks before the game would be presented to Nintendo, and even though the two developers worked 24 hours a day for two weeks, they didn't have much for the presentation. The game was so rushed; it was ported to a disk only four hours before the presentation that would take place. Despite all this, Nintendo was incredibly impressed by the results. Due to poor sales of the CD-i, the game had to be cancelled. What remains of the game is functional for a game cancelled so early in production, though the prototypes found have several glitches and bugs (for example, players can make Goombas freeze in mid-air by touching them and there is no way to swim in the underwater levels because Mario wasn't programmed to swim yet). Also, there are several levels that have no data in them at all. Whether or not the game will ever be finished by anybody is a mystery. Playthrough of the game by James Rolfe and Mike Matei for their James & Mike Mondays series. 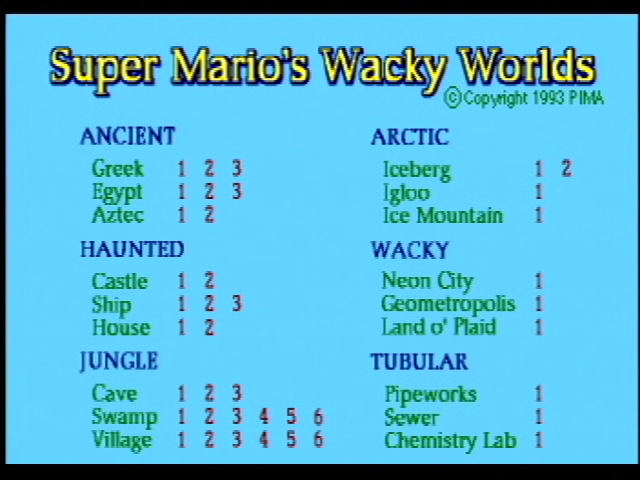 The link to the ROM of Super Mario's Wacky Worlds. ↑ The Mario Wiki's article on the game. Retrieved 04 Sep '18. ↑ Quebec Gamer's article on the game (courtesy of the Wayback Machine; page is in French). Retrieved 04 Sep '18.